As Hurricane Irma churned inland over the Florida peninsula in early September, photojournalist Brian Emfinger readied his drone. After the eye passed over Naples, calming the 100-mph-plus winds and torrential rains, he lifted off. The small unmanned aircraft have changed how some news organizations cover disasters. Hurricanes Harvey, Irma and Maria represented a “defining moment for the use of unmanned aerial systems in news gathering,” said Greg Agvent, the senior director of National News Technology and CNN AIR. 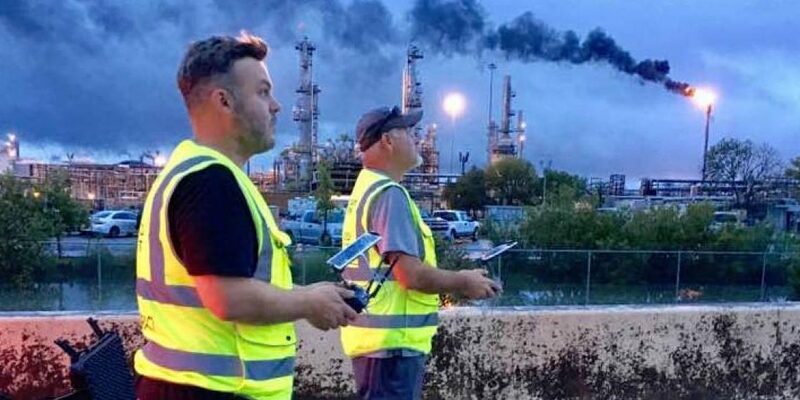 The reason is simple: Drones provide a lower-cost way to gather footage and provide access to scenes that cannot be captured from the ground. Just flash back a decade ago for a stark example. Andrew P. Scott worked for The Dallas Morning News when Hurricane Katrina struck the Gulf Coast in 2005. The paper chartered a helicopter and reported from the skies over New Orleans for several days, documenting the historic storm’s aftermath. The bill for the helicopter was nearly six figures. The USA Today Network used drones to cover 2017’s record-breaking hurricane season and the wildfires that burned more than 180,000 acres in Northern California. “We’ve been able to get crews out there and get to multiple different locations for a fraction of the cost,” Scott said. Drones have also become a more accessible, practical tool for journalists. Emfinger, an avid storm chaser and photojournalist for KATV ABC 7 in Little Rock, Arkansas, purchased his first drone on Amazon for $50 in 2013. He practiced indoors and outdoors, getting a feel for both close quarters and open spaces. By the time he graduated to a more expensive drone, flying was easy and he began to quickly make a name for himself. In 2014, Emfinger made national headlines when he used his drone to capture the destruction left by a tornado that had ripped through Mayflower, Arkansas, just moments earlier. At the time, using drones for commercial purposes, including journalism, was a contentious topic. The Federal Aviation Administration (FAA) investigated the video, and Emfinger agreed to a cease-and-desist order. He was not able to use drones professionally until August 2016, when the FAA eased regulations and introduced the Remote Pilot Certificate. Since then, drone use has exploded in the United States, and as of September 2017, more than 60,000 certificates have been issued, opening the door for journalists around the country.